Travelling North along Highway 13, depth is apparent by the way the road sides seem to converge into a point somewhere way past the treeline up ahead. 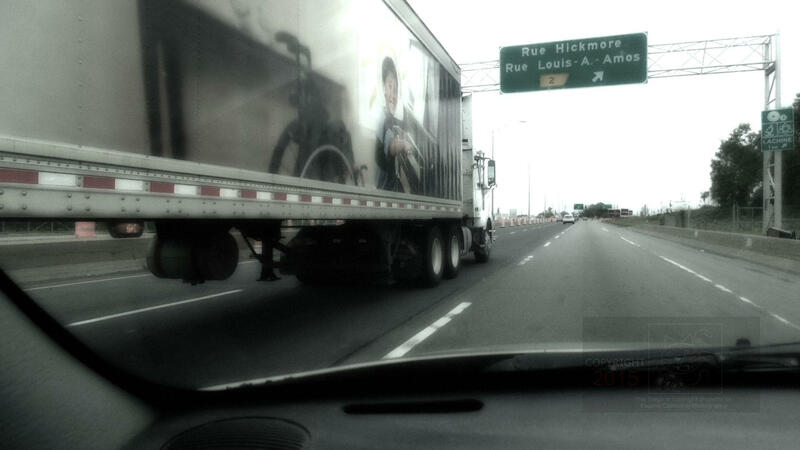 I was returning from downtown Montreal in my car doing about 90 km/hour when this semi-trailer’s driver decided I was too slow for him. Fortunately, I had my trusty old Fujifilm digital camera handy when I took this interesting shot of the action. It all happened just before we both passed under that overhead sign indicating the next exit onto rues Hickmore and Louis A Amos on the right.